Have you ever known someone from Lo Debar? You know, society treats them as the nothings. The ones that don’t look like the reflection in your mirror. Maybe they are a different color. Or, they smell bad. Or, they talk differently. Or, they live on the wrong side of town. Or, they have a physical handicap. You know the ones, they don’t look, act, smell, talk, or live like YOU. Or, maybe you’ve spent time in Lo Debar, feeling like a nobody, a no one, less than. Have you ever known someone from LoDebar? You know the ones, they don’t look, act, smell, talk, or live like you. A few thousand years ago a man named David had a best friend, his name was Jonathan – they were such good friends that it is written their souls were knit together. They made an oath, before God, to be friends forever. There was a huge problem though – you see, Jon’s dad was (a rejected) king and hated David (the soon-to-be-king). It was all tied to jealousy, in fact he hated him so much he tried to kill him, you can read about that here. This situation turned worse and the king had David hunted by a posse with orders to kill him, but they could never catch him. These power ploys always end in tragedy and this one definitely did – the king and his three sons were killed in a battle. When David found out his best friend had died, The Book says he lamented. Now, to Lo Debar and the less-than. David was the reigning king and everyone loved him – he was known to administer justice to all people. One day he asked his chief ministers if anyone remained from the house of Jonathan – if there were any living heirs to whom he could show kindness. Someone came forward and said yes – there is a son of Jonathan but he has clubbed feet and lives orphaned in Lo Debar. The boy’s name was Mephibosheth. He had a terrible self-image, he actually thought of himself as a dead dog and unworthy to be in the king’s presence. He was a less-than. did he remember what it was like to be thought of as not-good-enough as the youngest brother of eight? did he remember being hunted down like an animal by his best friend’s father? did he remember how humbled he was the day he defeated an evil giant? His mercy and compassion reached over the skeptics and nay-sayers and invited an orphaned boy, who limped and had no future, to his table and restored all his grandfather’s land to him. His mercy and compassion reached over the skeptics and nay-sayers and invited an orphan boy, who limped and had no future, to his table and restored all his grandfather’s land to him. Sit at THAT table, taste the grace and then let’s live it! One of my favorite stories. Thanks for writing about it today. What a great reminder to start the day. Thanks for visiting, Kari, I love this story too! Oh yes…let’s sit at the table of grace. But more importantly, may we invite ALL to sit at that table of grace with us just like in this story. Jesus was always doing that…always sitting with tax collectors, sinners, etc. Jesus embodied “diakonia” (service). We are all called to do the same! I have learned grace at LAHIA homeless sanctuary. People change when they move from Lo Debar to King David Highway. Sister – love the way you put that! King David changed my life forever! His humbleness boldness weakness strength and faith is a fine example of what being human is all about. 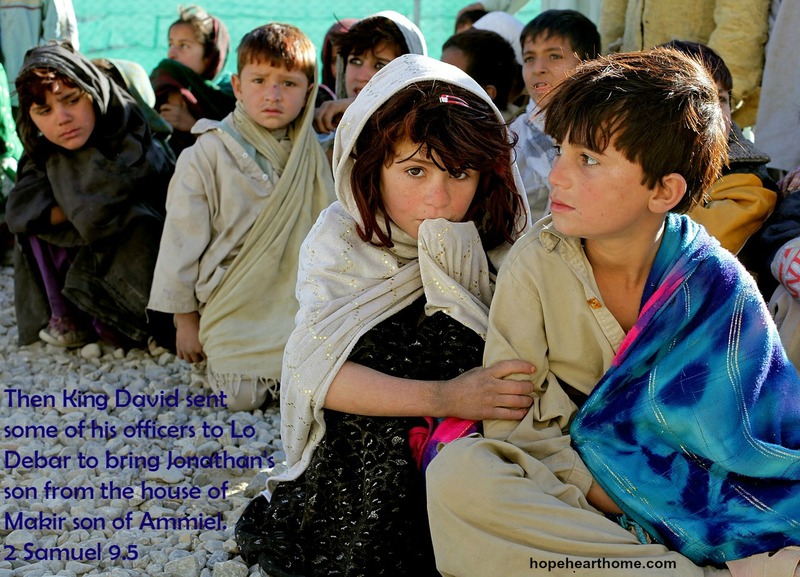 David – always had God’s heart even when he was a scoundrel! Always has mine, even when I am! A powerful story to sit with this afternoon. Thanks so much for sharing. And thanks for your visit to day too, Susan. I haven’t been getting around to other blogs as much as I’d like to lately, or writing much, so it was fun to join a link up today. Blessings. Beth, I love return visits – funny both our posts were about a table today! Oh friend… this is one of my favorite stories from the Bible… for real! I love it! And also… the way you tell this story for those who have maybe never read it… priceless! This is such a great post! The Reader’s Digest condensed story for those unfamiliar!!!! Sitting together and souls knits together are two of my very favorite things. Love this. So glad you linked up at #ThreeWordWednesday. I love that phrase “our souls knit together.” So poetic. Wonderful encouragement- so glad I stopped by. Community is so vital. Community rescued me this past winter! Thanks for visiting. May I always remember to treat each person with dignity, none better or worse than the other. In God’s eyes we are all the same. Thanks for reminding me of this story from Lo Debar. Lisa, thanks so much for visiting. Amen to your comment!